Contract and procurement fraud, collusion, and corruption are worldwide problems. Such wrongdoing causes federal, state, and local governments, as well as private-sector corporations and businesses, to lose funds and profits, while the wrongdoers unjustly benefit. Bid riggers conspire to eliminate fair and open competition and unjustly increase prices, allowing some to monopolize industries. Too often, contracting officials and others responsible for placing orders or awarding contracts compromise their integrity and eliminate fair and open competition to favor vendors offering bribes or gifts. This results in unfair playing fields for vendors and causes financial losses for businesses, government agencies, and taxpayers. 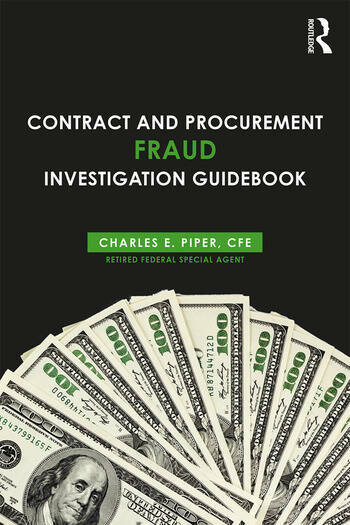 Charles Piper’s Contract and Procurement Fraud and Corruption Investigation Guidebook educates readers on fraud and corruption schemes that occur before, during, and after contracts are awarded. This book teaches not only how to identify such wrongdoing, but also how to investigate it and prevent reoccurrence. Piper shares the Piper Method of Conducting Thorough and Complete Investigations, his innovative and proven method of investigating contract and procurement fraud, and demonstrates its principles with personal, on-the-job examples (which he calls "War Stories") woven throughout the text. Intended for criminal justice students, as well as investigators, auditors, examiners, business owners, policy-makers, and other professionals potentially affected by fraud, this book is a must-read guide to effective procurement and contract fraud investigations from inception to testimony. * - Investigator and Fraud Fighter Guidebook: Operation War Stories; Charles E. Piper: Copyright © 2014 by John Wiley & Sons, Inc. All rights reserved. Charles E. Piper, CFE, CRT, is an award-winning investigator and author. He served for over 30 years in law enforcement including 20 years as a special agent-criminal investigator with the U.S. Department of Defense (DoD). He has successfully conducted numerous internal and external contract & procurement fraud investigations as well investigations involving collusion as public corruption (bribes and kickbacks). As a federal agent, he led interagency investigations and worked jointly with some of the most experienced and well trained fraud fighters in the world. His investigations have resulted in millions of dollars in recoveries, as well as criminal convictions and civil judgments against fraudsters. Piper also served seven years in the U.S. Army in the Military Police Corps and additional years as a city police officer and supervisory detective. He is currently the owner of Charles Piper’s Professional Services in West Tennessee which provides investigative, consulting and training services, Piper is a Certified Fraud Examiner (CFE), Certified in the Reid Technique of Interview and Interrogation (CRT) and a graduate of three law enforcement-investigative academies (federal, state and military). He is the author of multiple books, including Investigator and Fraud Fighter Guidebook: Operation War Stories, and Healthcare Fraud Investigation Guidebook, and has received numerous awards, including Special Agent of the Year for his service in law enforcement, and the 2014 Associate of Certified Fraud Examiners’ (ACFE) Hubbard Award.